The company says commuters could use JPods to avoid rush-hour congestion and weather-related traffic problems. They look like pods on a ski lift. Or a ride at an amusement park. It’s rapid transit above ground, and Boston is taking notice. 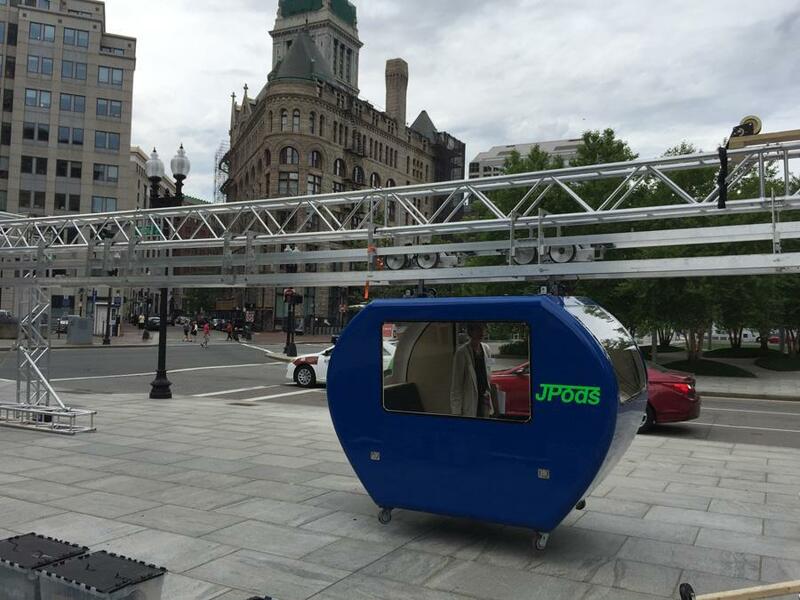 A Minnesota-based company called JPods has been making the rounds in the city, pitching its elevated transportation network as the next logical step in rapid public transit. Instead of languishing in traffic snarls in the city, he said, commuters would be able to hop on an elevated pod, which would zip them to their destination on guided rails. James said his company’s network would be powered by solar energy, making it safer, faster, cleaner and more affordable than current modes of transportation. And he’s eyeing the Seaport District and Somerville as perfect Massachusetts destination sites. It all seems like a crazy concept — Cars above ground? — but city and state lawmakers are considering it. City Councilor Stephen J. Murphy of Hyde Park urged his colleagues to consider bringing the new rapid transit to Boston, saying it would be would be privately constructed, funded, and subsidized. He noted the deluge from last winter’s storms that crippled the region and daily rush-hour gridlock, saying the time was ripe for transportation relief. Republican state Senator Robert L. Hedlund of Weymouth has introduced a measure in the Legislature in support of the pods, arguing it would also surpass current modes of public transportation. James was in Boston in May, presenting his concept to city transportation officials and getting an audience on the Rose Fitzgerald Kennedy Greenway, where one of the pods was on display. He’ll return Aug. 22-23, he said. A Minnesota native and West Point graduate, James said he created the network to help end the country’s dependence on foreign oil and to make public transit more reliable. So far, Boston’s transportation commissioner, Gina Fiandaca, seems warm to the concept.